Newly released video features shots from the ranch where Granger's father lived. Transferred to trauma center, full recovery expected. The lineup sets the tone for what are likely to be the biggest breakout stars in country music in the next year. 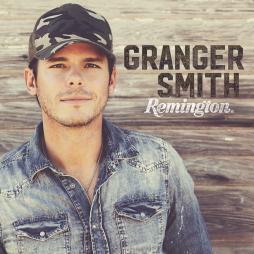 From the new album "Remington", Granger performs the second single off the album. 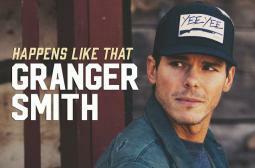 Friends and fans joined Granger Smith on the second day of his "Granger Across Merica" tour, which included stops in Philadelphia, PA, Hartford, CT, Providence, RI, Boston, MA, Portsmouth, NH, East Rutherford, NJ, and New York, NY, to recite the Pledge of Allegiance. 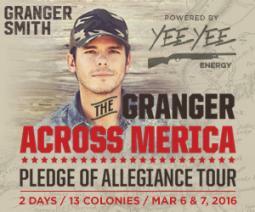 GRANGER SMITH WRAPS UP DAY 1 OF HIS 48-HOUR "GRANGER ACROSS MERICA PLEDGE OF ALLEGIANCE TOUR"
Granger Smith closes out day one of his 48-hour, whirlwind "Granger Across Merica Pledge of Allegiance Tour Powered by Yee Yee Energy," which took him to seven states on Sunday. We finish the tour Monday, March 7, at Battery Park in New York City. Need a date? We've got 'em all. Every date you need to know about the new album release right here. 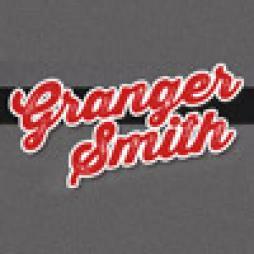 "Backroad Song" becomes Granger Smith's first #1 at country radio.